Winner of multiple awards, the “Freizeit In” conference and event hotel in Göttingen is one of the most successful conference hotels in Germany. Its affiliated sports and sauna area came back under full control of the hotel after the cancellation of leasing contracts with external operators. The hotel chose GANTNER billing system to handle this complex, multifunctional billing application. The system, which uses LEGIC contactless cards, also provides access control to offline door locks of hotel room doors as well as the turnstile barriers in the wellness area and its electronic locking system for changing room lockers. That same card can be used throughout the entire complex, from the hotel area to the SPA, from the restaurant to the bar and in therapy areas, as the GANTNER system provides all the convenience of cashless, contactless payment with just one single LEGIC guest card. Winner of multiple awards, the “Freizeit In” conference and event hotel in Göttingen is one of the most successful conference hotels in Germany. Its affiliated sports and sauna area came back under full control of the hotel after the cancellation of leasing contracts with external operators. The hotel is set to continue all the existing product offerings under its own control. The aim of this consolidation was to offer all the areas of operations that had previously been split up in a single new high-quality SPA. To achieve this, an expert team developed a new marketing concept that focuses on the concept of a modern SPA. Extensive construction work to convert and extend the existing fitness and sauna area was required in order to meet the demands of this new SPA concept. The total cost of the conversion work was 4.2 million Euros. Obtaining planning permission took 18 months and construction of one of the largest and most up-to-date wellness facilities in Germany lasted 6 months. 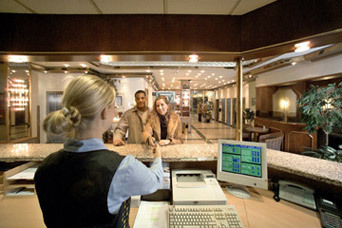 In order to consolidate various areas of operations that had previously been run separately, the client wanted a new electronic billing system that was capable of combining all services using a single customer card (management of hotel rooms, control of fitness equipment, voucher management, access control, tennis court, car park and guest management). After thorough market research, the hotel operators opted to use the GANTNER billing system for this complex, multifunctional application. A 33-strong SPA team now looks after guests at this 8,800 square metre site complete with a day SPA, sauna centre, tennis, fitness and squash. The Vital spa concentrates on three themes (health, fitness and body care) and offers an upmarket quality range of active services for day guests, members and hotel guests alike. The GANTNER system plays a crucial role in managing all the various entitlements and also in ensuring that guests are comfortable. Access control to offline door locks of hotel room doors – with an interface for Fidelio hotel reservation software – as well as control of the turnstile barriers in the wellness area and its electronic locking system for changing room lockers are all conveniently operated by a contactless guest card with a built-in LEGIC transponder chip. Authorisation to use tennis courts is managed equally easily using the LEGIC card and as soon as a cardholder walks past the terminal at the entrance to the tennis court the lighting is switched on automatically. The management of therapists and therapy rooms is significantly more complex but the GANTNER system also handles this. Throughout the entire complex, from the hotel area to the SPA, from the restaurant to the bar and in therapy areas, the GANTNER system provides all the convenience of cashless, contactless payment with just a single guest card. After just a few months it was obvious that the new concept adopted by the “Freizeit In” was a good move because predicted membership and visitor numbers grew rapidly and are now plans to widen the product offering in 2007. The Mexican national football team stayed at the “Freizeit In” in Göttingen during the football World Cup and were also delighted with the hotel and its facilities. Even in the preliminary round of the competition, trainer Ricardo La Volpe made the decision not to leave their accommodation in Göttingen, even if the team reached the last sixteen.